Andy Hardy: Dad, I don't understand these modern girls. Judge Hardy: In what way? Andy Hardy: Well, Polly, for instance. Sometimes she won't let you kiss her at all. But this Cynthia! Oh, she'll let you kiss her whenever you want. She doesn't want to swim, she doesn't want to play tennis, go for walks... All she wants to do is kiss you. I'm a nervous wreck! One of the most successful and longest running series in Hollywood history, the wholesome, all-American Andy Hardy films captivated audiences from the tail end of the Depression all the way through World War II, reinforcing family values and combining touching personal themes with gentle comedy. Although the format wasn�t invented yet, the chronicles of Judge Hardy�s clan could be called the first real sitcom, and faithful viewers eagerly awaited each new installment. The young, brash, exhaustingly exuberant Mickey Rooney attracted the lion's share of attention, and his portrayal of the young, brash, exhaustingly exuberant Andy Hardy helped catapult him to superstardom. But the blessing eventually turned into a curse, when America refused to accept the pint-sized actor as anyone else. Back in 1938, however, such problems were still a decade away, and audiences flocked to see the 17-year-old Rooney juggle a trio of smitten teen girls in his latest Hardy film. Love Finds Andy Hardy is the fourth entry in the low-budget series�and one of the best�but the reasons for its success transcend the storyline and even Rooney. Don�t get me wrong; the script possesses more flair than the usual Hardy standard, and Rooney turns in his typical high energy performance (although why audiences embraced him so fervently remains a mystery to me). No, the reason this Hardy film sings (and swings) is due to the addition of Judy Garland and, to a lesser extent, Lana Turner to the cast. Back in the days of long-term contracts and studio grooming, the Hardy films acted as a training ground for young starlets on the MGM lot, giving them both exposure and valuable experience before they graduated to starring roles�if they were good enough. Such future MGM leading ladies as Esther Williams, Donna Reed, and Kathryn Grayson all got their start romancing Andy Hardy, but Love Finds Andy Hardy is the only film in the series that produced two future stars, and it's great fun to watch Turner and a pre-Wizard of Oz Garland light up the screen in supporting roles, and vie for Andy's attention. Garland (in only her fifth film) is assigned the part of ugly duckling Betsy Booth, a debutante from New York City, who's visiting her grandmother in the Hardy hometown of Carvel during the Christmas season. She worships Andy, a typical adolescent male obsessed with cars and girls, but he treats her like his kid sister instead of a potential flame. And why not, when the flirtatious, voluptuous Cynthia Potter (Turner, in her fourth film) throws herself at Andy at the drop of a hat? Forced to go out of town over the holidays, Cynthia's boyfriend Beezy (George Breakston) is petrified she'll fall for another guy, so he pays Andy to date Cynthia while he's away. Andy is shocked (and initially delighted) by Cynthia's voracious romantic appetite, a welcome change from his long-time steady, the prim and petulant Polly Benedict (Ann Rutherford), who's also away on vacation. But soon the novelty wears off, and Andy, worried over Polly's impending return, tries to extricate himself from Cynthia's web�which, as flies drawn to honey quickly discover, is no easy task. Betsy steps in to save the day, and her impressive vocalizing finally makes Andy see her in a different, more flattering light. Chock full of nostalgic charm, Love Finds Andy Hardy flaunts an irresistibly sweet, gosh-golly-gee-whiz attitude that's more genuine than the Leave It to Beaver-style sitcoms of the 1950s. And the moments when the film rings most true concern the mundane aspects of everyday life�father-son talks, a family illness, gentle but firm reprimands, and good-natured mischief. Rooney often goes overboard in his portrayal, but Garland, Turner, and especially Lewis Stone (as the benevolent Hardy patriarch) keep the proceedings anchored in reality and temper Rooney's lunacy. The film especially brightens when Garland is on screen, and even at the tender age of fifteen her potent magnetism is readily apparent. In fact, her appearance so energized the series she would be required to grace two subsequent Hardy films (1940's Andy Hardy Meets Debutante and 1941's Life Begins for Andy Hardy), despite her rising status at the studio. Here, she sings three first-rate songs: In-Between bemoans her "tween-ager" existence with a combination of pathos and dry wit ("I'm too old for toys, and I'm too young for boys�"), while the zippy Meet the Beat of My Heart highlights Garland's fine rhythmic sense. The film's showstopper, however, and the tune that turns Rooney's head is undoubtedly It Never Rains, But What It Pours, in which the young Garland fires on all cylinders, impressively belting out the lyrics with her trademark verve. It's her way of serving notice that she'll be a fixture in MGM's galaxy for years to come. 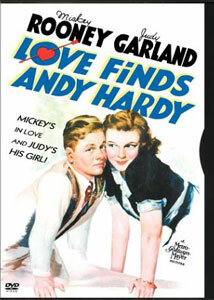 Some of today's jaded viewers will certainly find the film's aw-shucks, homespun tone dated�even excruciating�but if viewed with the proper attitude and aware of its historical context, Love Finds Andy Hardy is delightful family entertainment�or, as the Hardys themselves might call it, perfectly swell. Image Transfer Review: Warner has produced an above average transfer for this antique, with the black-and-white image exhibiting plenty of contrast and gray level variance. A few wispy vertical white lines occasionally intrude, but grit and specks are kept to a happy minimum. Some grain is evident, but far less than I anticipated for a 65-year-old film. Details come through nicely and the print still possesses a good deal of vibrancy. Audio Transfer Review: The mono track is surprisingly clean, with only slight hiss and a few noticeable pops and crackles. Garland's vocals sound pure and full, and the brassy orchestra enjoys fine presence. Dialogue is always clear and understandable. Extras Review: A few pleasant extras add context and fun to the disc, beginning with an insightful five-minute introduction by Garland authority John Fricke. Always a source of fascinating information, Fricke gives a brief history of the Hardy films, filled with film clips and anecdotes, and relates some little-known trivia regarding Love Finds Andy Hardy itself. Ann Rutherford, who plays Polly Benedict, also contributes to this slickly produced piece. MGM often promoted its films through its popular Leo Is on the Air radio series, and the Love Finds Andy Hardy episode includes an extended audio clip from the movie, as well as two Garland numbers, Meet the Beat of My Heart and It Never Rains But What It Pours. Unfortunately, the audio quality is rather poor, with significant distortion frequently intruding, but classic film fans will welcome this rarity in spite of its compromised condition. Finally, the Andy Hardy Trailer Gallery includes previews for Love Finds Andy Hardy and Life Begins for Andy Hardy, in which Garland also appears, as well as a rare holiday promotional trailer. The latter gives us a chance to share Christmas festivities with the Hardys, and allows them the opportunity to thank their loyal audience for supporting them over the years. Sadly, the trailer for Andy Hardy Meets Debutante, the other Garland-Rooney collaboration in the series, does not appear on this disc. Nobody would ever call it a cinematic masterpiece, but Love Finds Andy Hardy takes us back to an innocent era, and wins our affection with its warmth and sincerity. Garland's potent pipes and natural acting give the film a major boost, and proved to audiences of the day this diminutive dynamo was indeed the real deal.